Looking to write a TV pilot that sells? Looking to find tools that will lead you to this outcome? 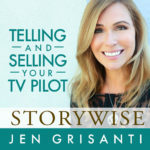 “Telling And Selling Your TV Pilot” is for you. This ultimate video training series contains a story system and story tools that will guide you on how to write a TV pilot that sells. Think of this video series as your treasure chest of information. The course contents contains 16 videos and 28 texts.